Bumpers are generally made from a talcum based polypropylene called Thermal Plastic Rubber (TPR). TPR is very cooperative to manipulate and reshape. It welds easily, but does not flex well once welded. TPR does go furry when sanded so it must be finished with a fine grade so the painter can refinish to an acceptable standard. Many repairs to plastic bumpers are done using filler. Filler is inflexible and so is prone to cracking, as any impact to the area is likely to form new cracks in the filler. Plastic can be manipulated and welded forming a strong and flexible repair. 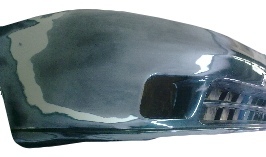 Plastic bumpers are intended to take minor knocks without leaving a dent. We are the best in the business with plastic bumpers, our finishes are always of the highest standards.